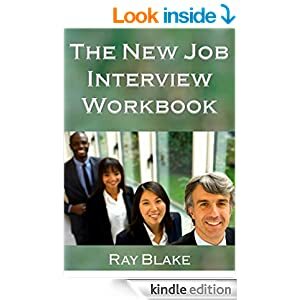 My new book is all about making a Job Interview an easy and enjoyable experience that will result in a job offer. I wrote about it here. 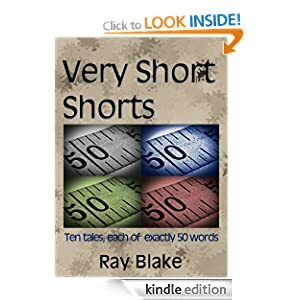 I've now added a Kindle version to the Amazon store. The link below will take you to the book's page in your local Amazon store. I had an idea to produce an insert for the Midori Traveler's Notebook that would help people struggling with finding a job. For many people, making the most of a job interview is difficult, but there are ways to prepare that will make most interviews a breeze. So I wrote them into a workbook that you can download, print and add to a Traveller's Notebook or use on a standalone basis. 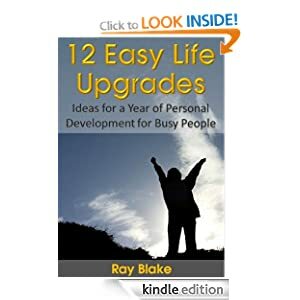 The workbook is free to download. You can choose either the A4 version or the Letter version. Either way, print double-sided, flipping on the short edge. 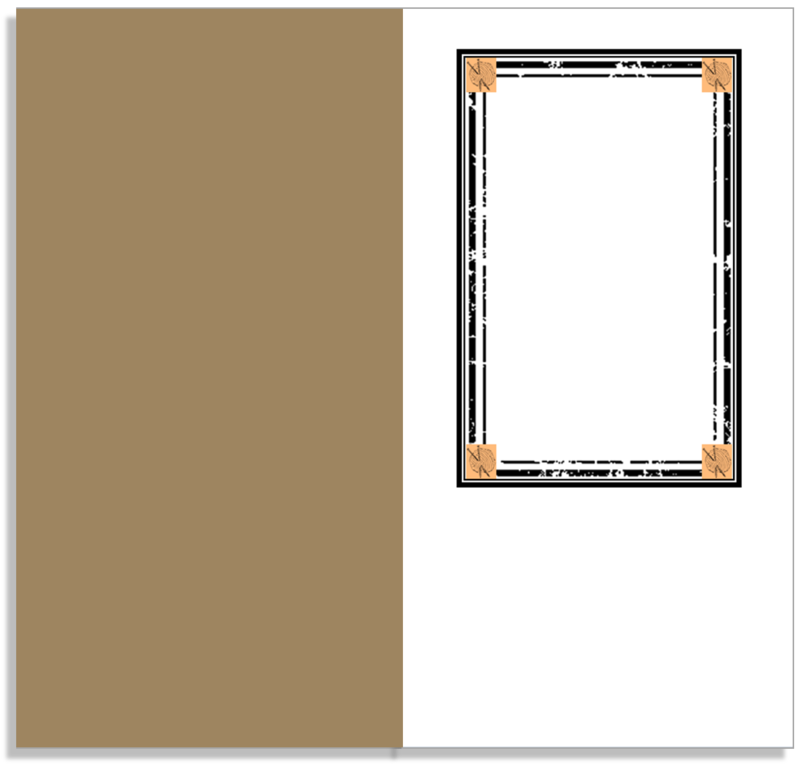 You can also download an A4 cover or a Letter cover to print onto cardstock, although this is very much optional. 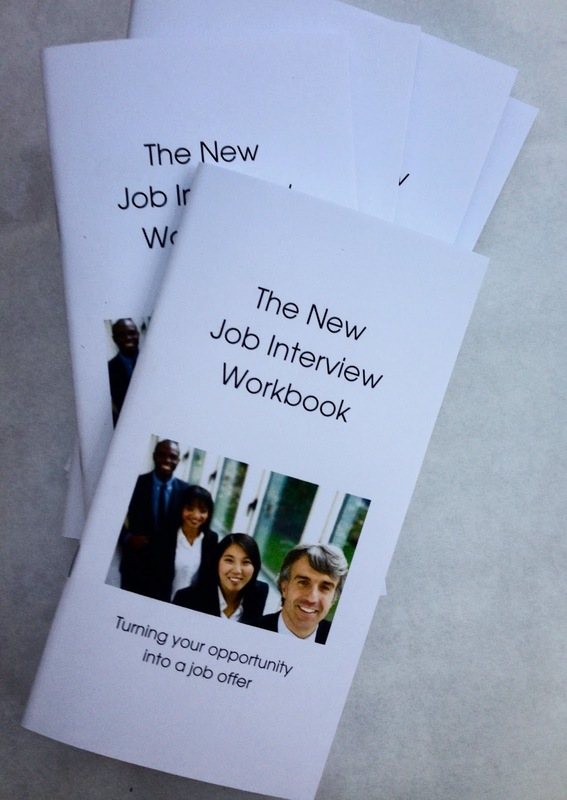 If you know someone who will be attending a job interview and might benefit from this, why not make one for them? UPDATE: There's now a version for Kindle. You can get it here. 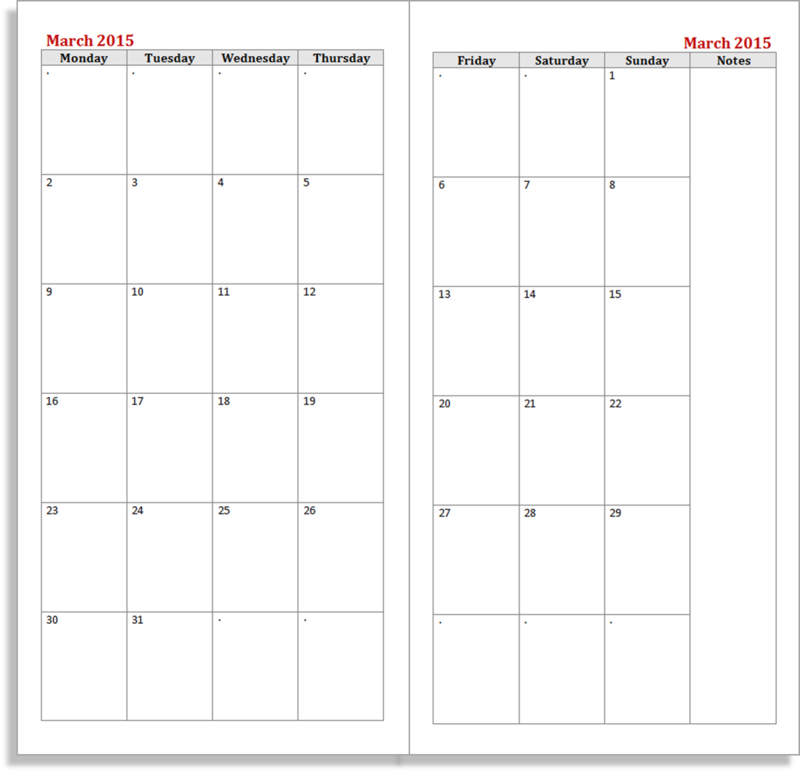 If you think this layout might suit you, feel free to download and use it. There are a few different download options depending on whether you want to just download and print the 2015 set or think you might like to tinker with the layout, or produce sets for other years or different periods. You can download the 2015 set as a full A4-sized document. 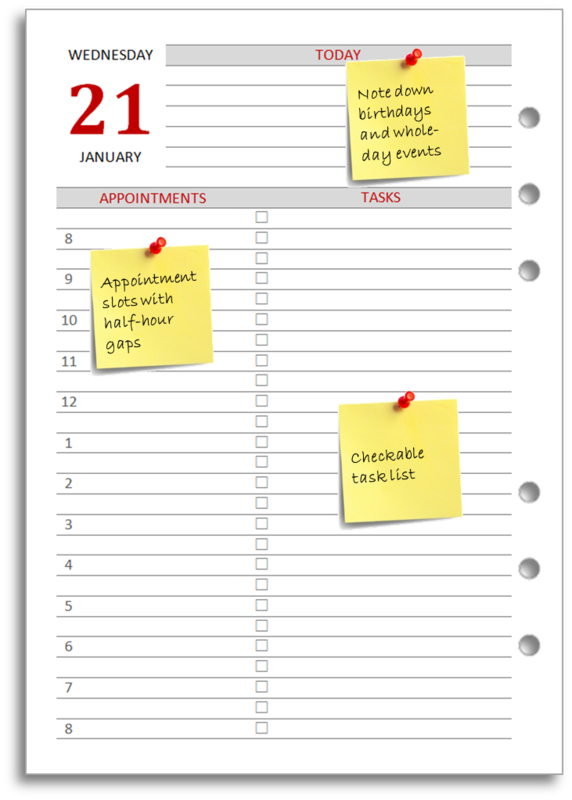 If you want to use the set in your A4 Filofax, then just print it as it is. 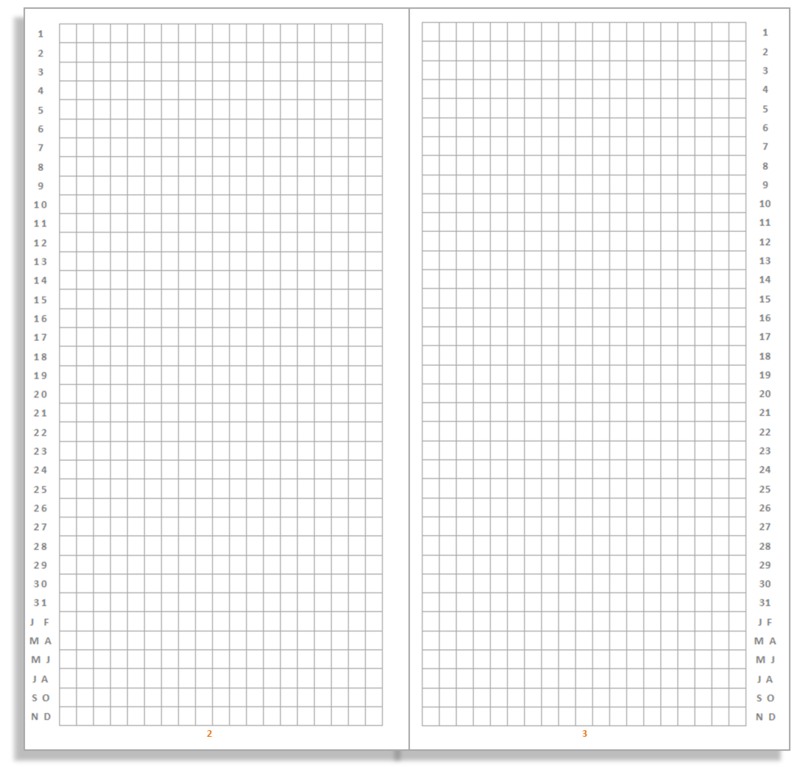 If you're printing for an A5 Filofax, then print the set in booklet mode and then cut the A4 sheets in half. 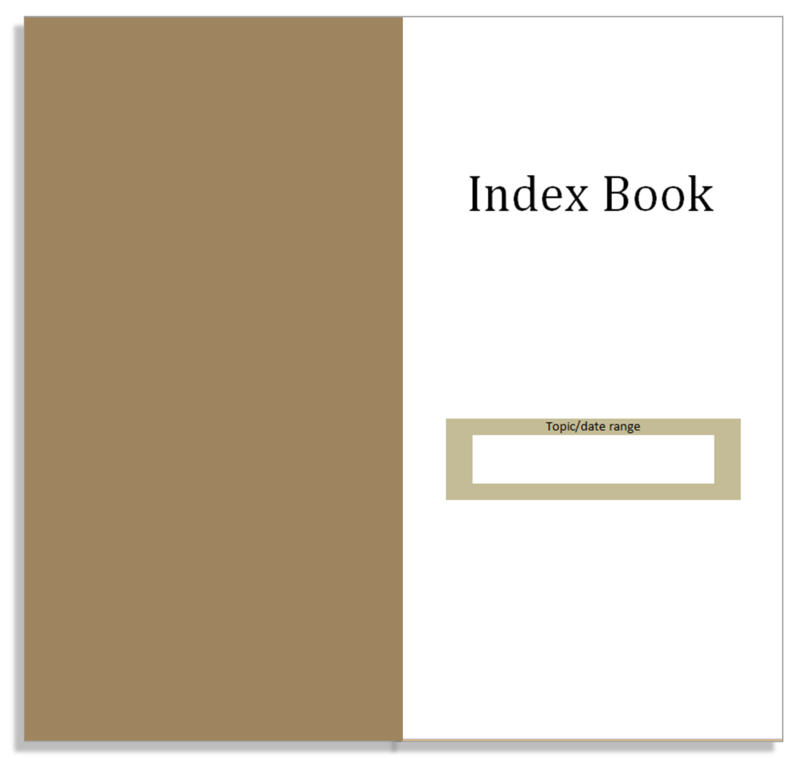 You can choose to download the Word version or the PDF version in this format. If you're using A5, though, and you don't want to have to bother with booklet mode, you can just grab this PDF version, which is pre-shrunk. 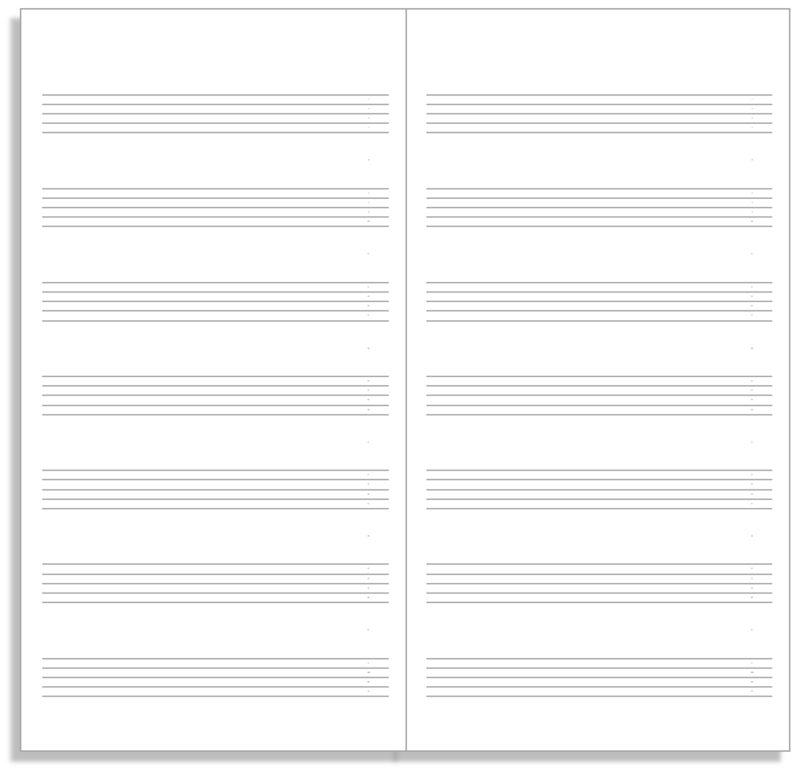 Just print double-sided on A4 paper (flip on the short edge if you don't want every other page to be upside down) and cut in half. Don't like the colours? Want to track different hours? 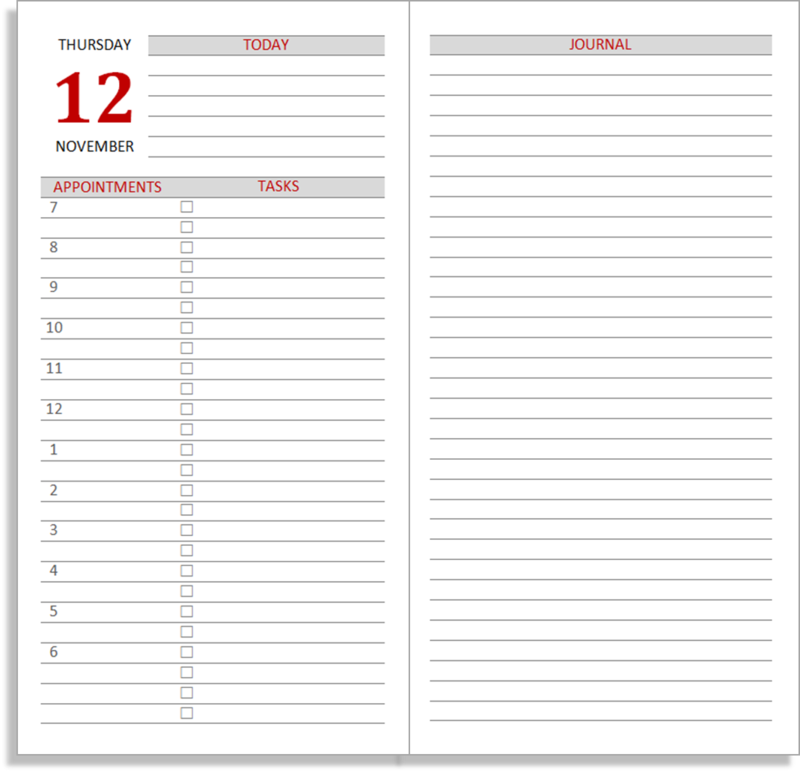 Want a more structured journal page? How about if you need a set for an academic year or for - say - 2019? Then you need to download the source files. You need both the Word source file and the Excel file and a working knowledge of mail merge. Elsewhere on this site you'll find tutorials and videos to help you. 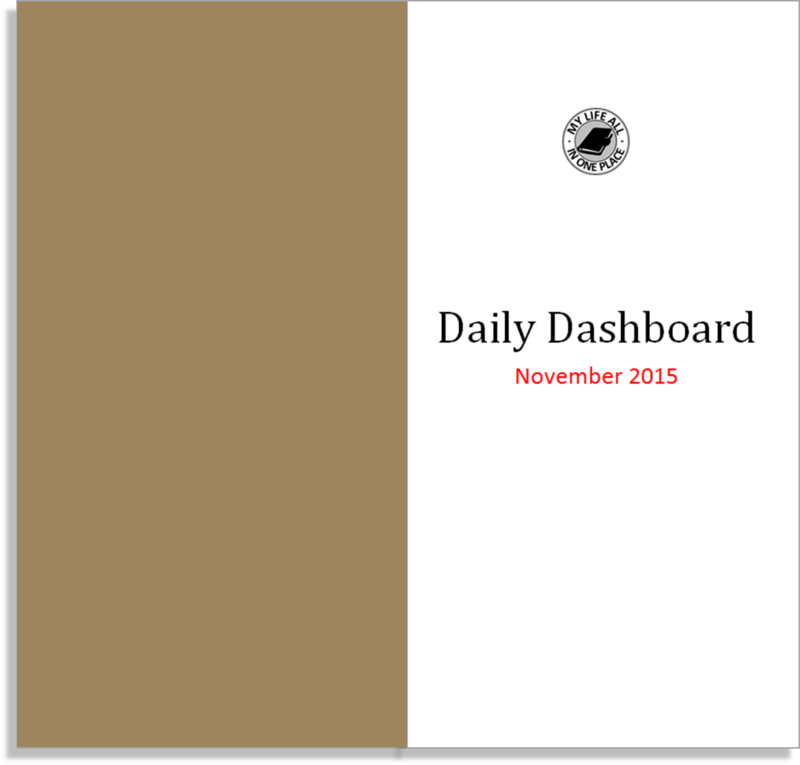 Start with the information at the bottom of the Free diaries pages link at the top of this and every page. 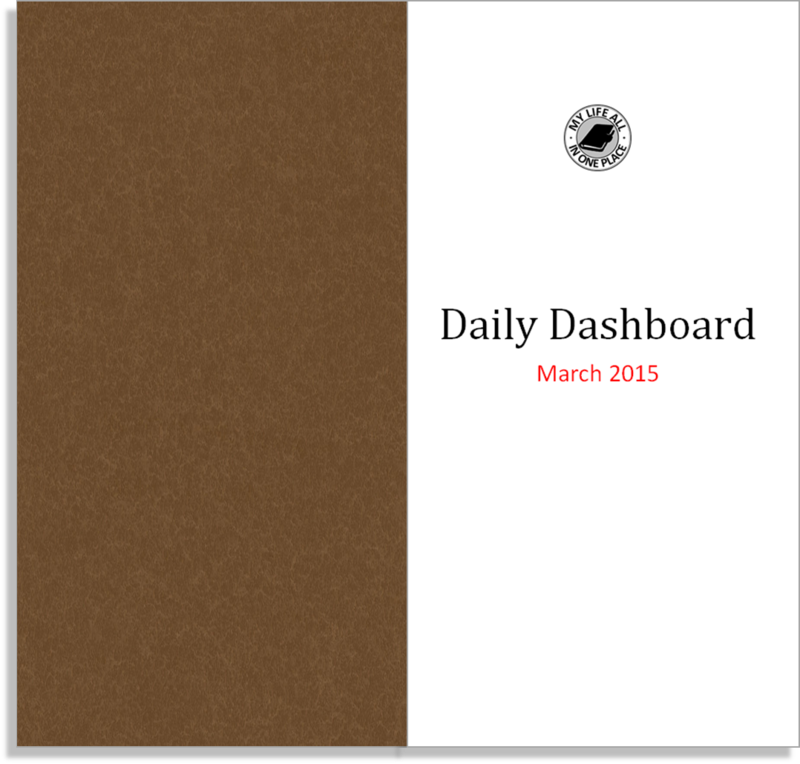 I launched my new Daily Dashboard insert last month and invited feedback. Based on the feedback I received, version 2 is now ready. 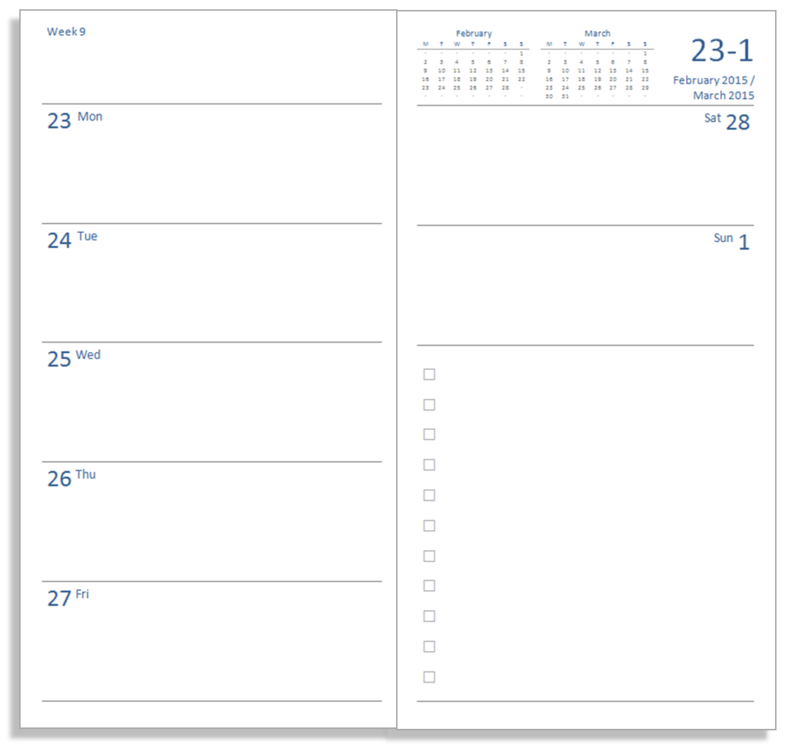 I've played with the times to allow more flexibility around the beginnings and ends of days and there is now a month view at the front of each month's insert. So here are the files. This one started life when Jaya Purswani explained that she was after a slightly different grid layout, one that would allow her to plan knitting stitches. It sounded like it might be easy to adapt my Seyes ruling template and this proved to be the case. Anyway, it seems there are enough knitting devotees in the Midori community to justify making this generally available, so here it is. 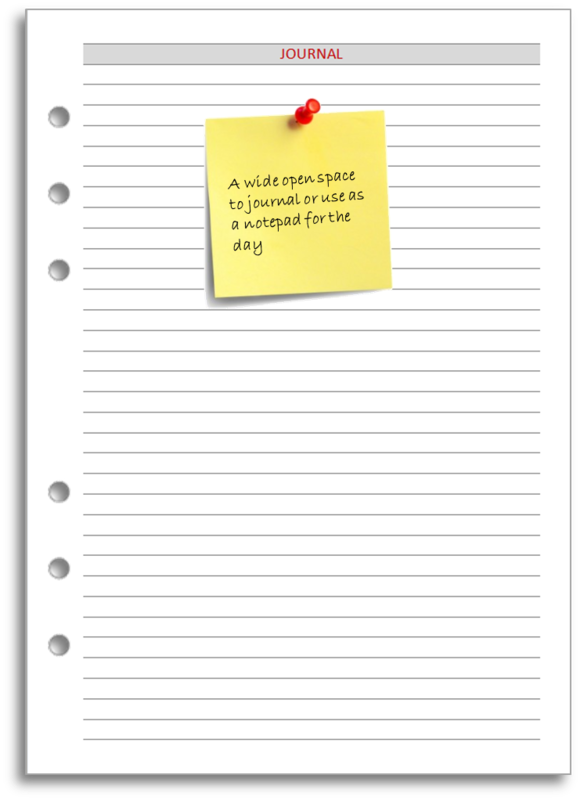 You can choose the A4 paper Word version, the A4 paper PDF version. If you insist on being American and thus unable to enjoy the aesthetic perfection of A4 you can choose instead the Letter paper Word version or the Letter paper PDF version. If you download the Word version, you'll be able to edit the file and play about with the format and content. You can choose the A4 paper Word version, the A4 paper PDF version. If you are American and thus have to work with oddly-sized paper then you can choose instead the Letter paper Word version or the Letter paper PDF version. If you download the Word version, you'll be able to edit the file and play about with the format and content. 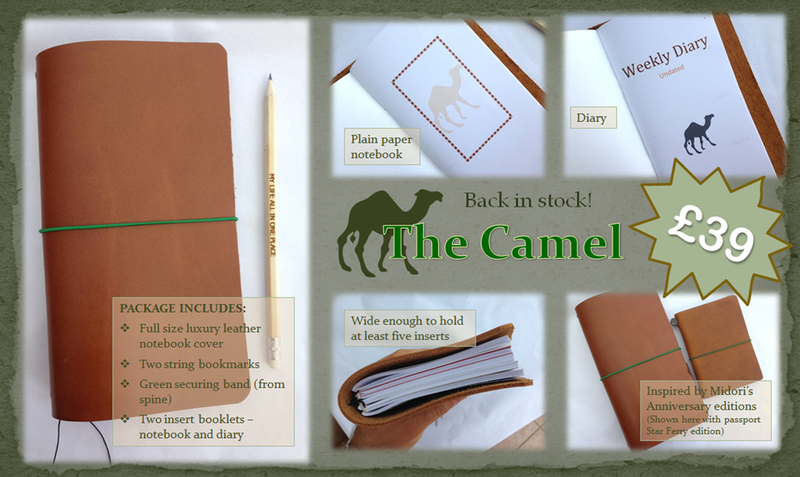 Midori's Fifth Anniversary Camel TN is no longer available - at any price, but there is still a lot of love for it. I have made my own special edition tribute to this iconic notebook. 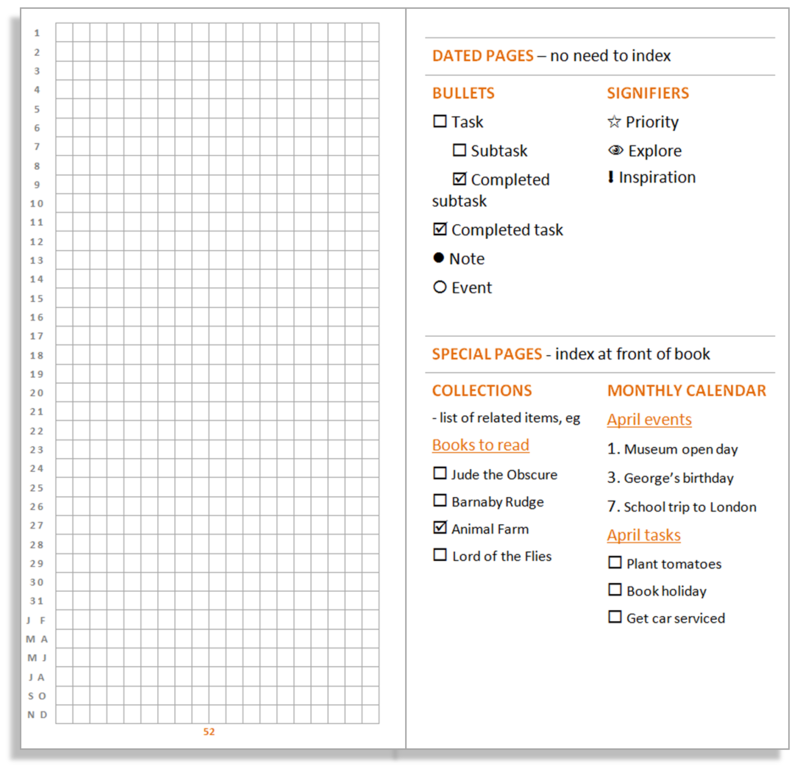 Alternative stringing for your DIY Traveller's Notebook. 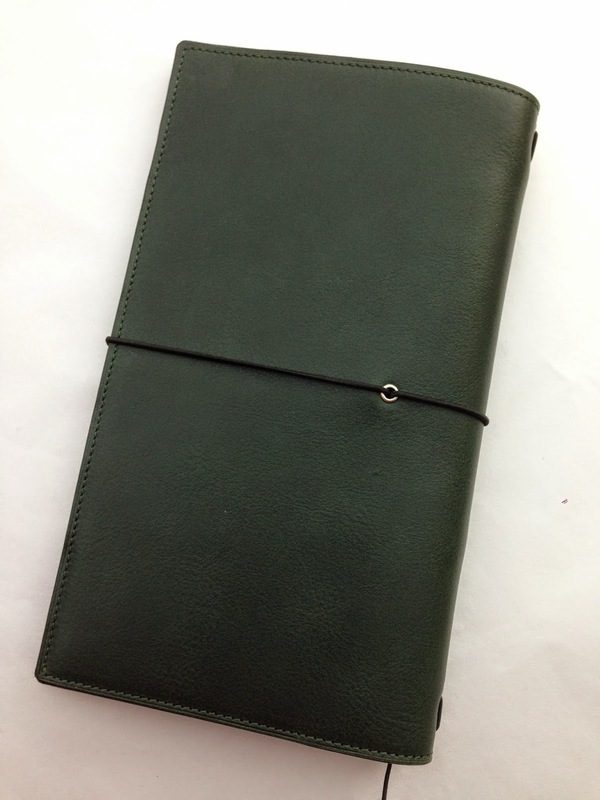 I've previously posted instructions on making your own Midori-style traveller's notebook. Here is the video in case you missed it. 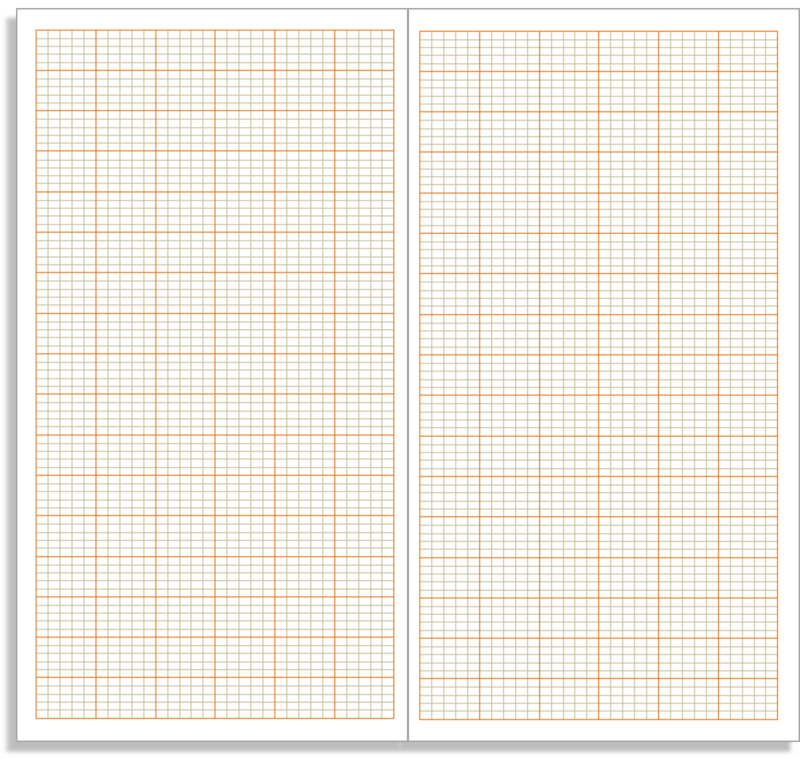 Which configuration you choose will depend on how packed you want your notebook to be. 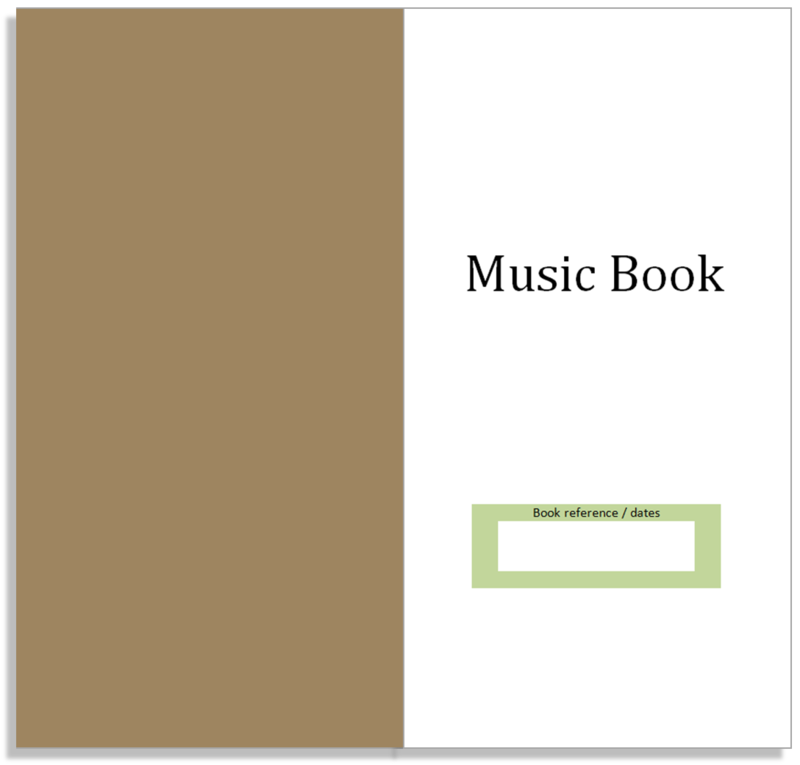 Using the instructions here and using the two side-by-side strings independently will enable you to easily insert six booklets. 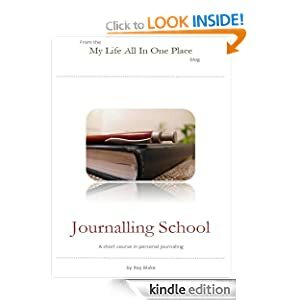 I was asked if I could expand my daily journal booklet to give each day two pages and serve as an all-in-one daily log. One month comprises a full booklet, and I'm offering ready-made sets initially for December. Based on feedback I'll look to finalise the design and make these a standard item for free download for 2015 and beyond. You can choose the A4 paper version or the Letter paper version. 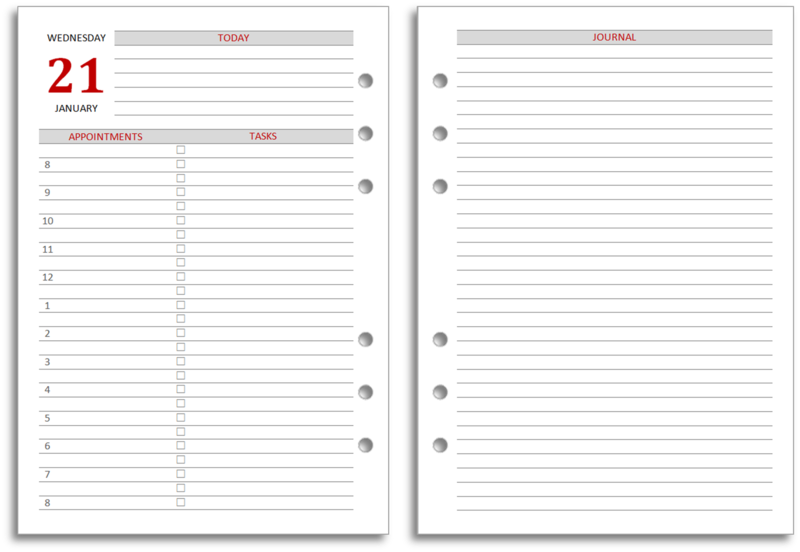 I have designed lots of inserts for the Midori and they are all free on this site to download and print for yourself. However, I am aware that some people for whatever reason can't or don't want to print and bind their own inserts. 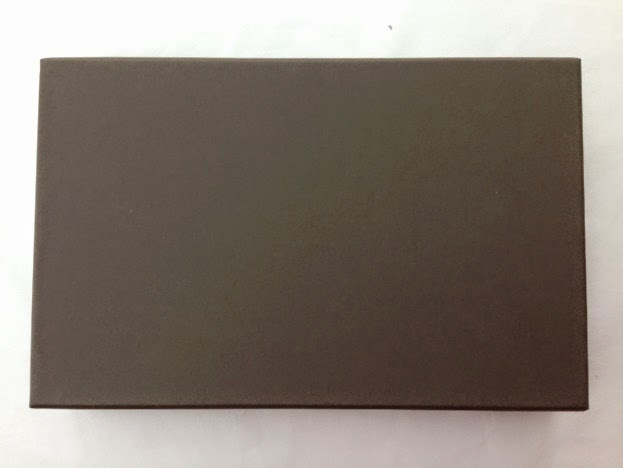 For a limited period, I'm offering readers the chance to buy a pack of my full size inserts ready-made, printed and bound in leatherboard covers. Read more about this insert here. To purchase a 2015 Starter Pack, please email me for payment instructions. 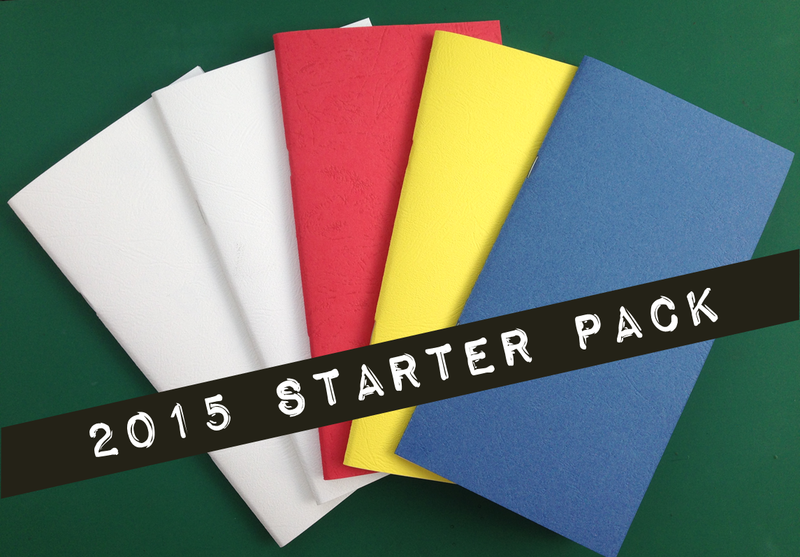 The 2015 Starter Pack costs £22 and I will send it anywhere in the world without any additional shipping charge. Of course, you remain welcome to download and print any or all of these inserts yourself for free. Today I have a review you are going to want to read. Gillio’s new Giramondo notebook cover has been hotly anticipated and I’ve got one. After the review, I’ll give details of a giveaway for one lucky reader (yes, you can own this review Giramondo) and a substantial discount for everyone else. It looked fairly unprepossessing. A surprisingly heavy, dull-coloured box emerged from its cocoon of careful packaging. It had the kind of gravitas that requires one to take a deep breath before venturing further to lift the lid. 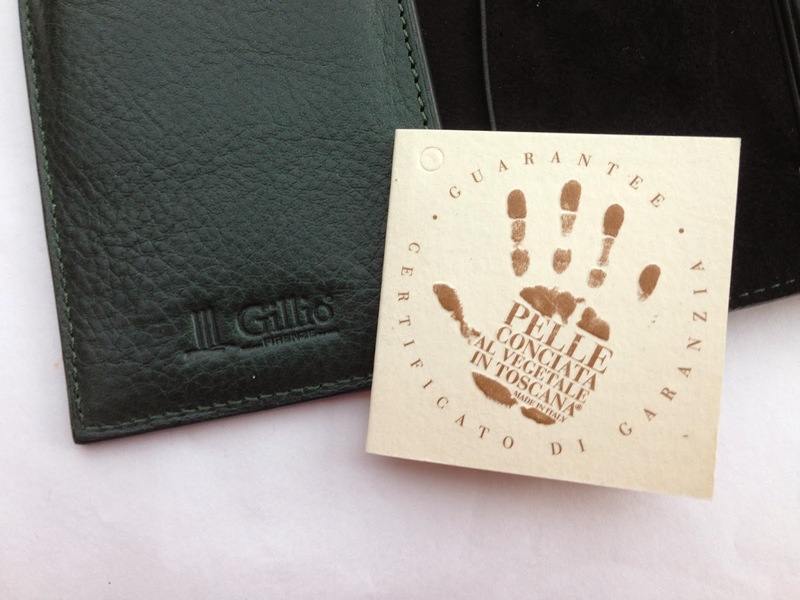 But open it I did, to find a further layer of protection, a brown protective pouch with the famous logo and slogan in gold. Enough teasing. Here it is. 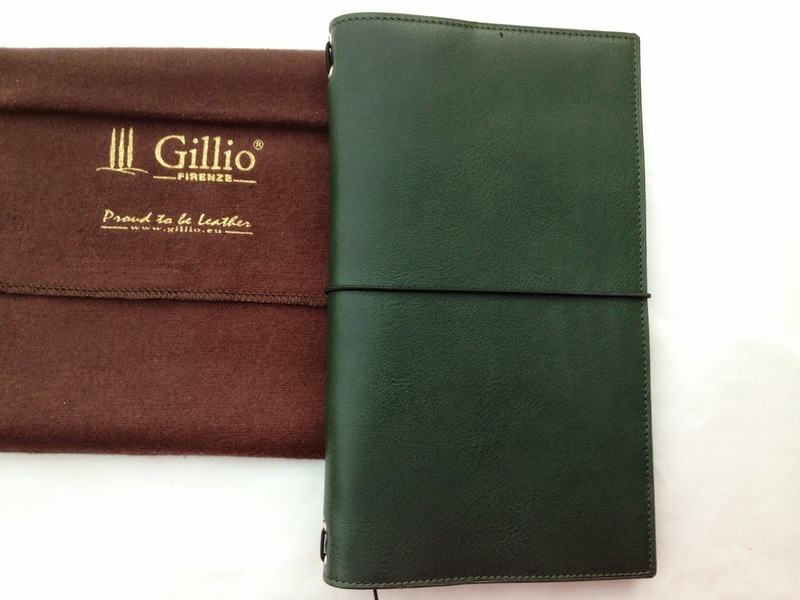 Gillio’s Giramondo (Italian for ‘Golbetrotter’) is a traveller’s-style notebook cover, but it isn’t like any I’ve seen before. I’ll mention the biggest difference first, to get it out of the way. The Giramondo costs €165 That’s about £130 at current rates, or a little over US$200. 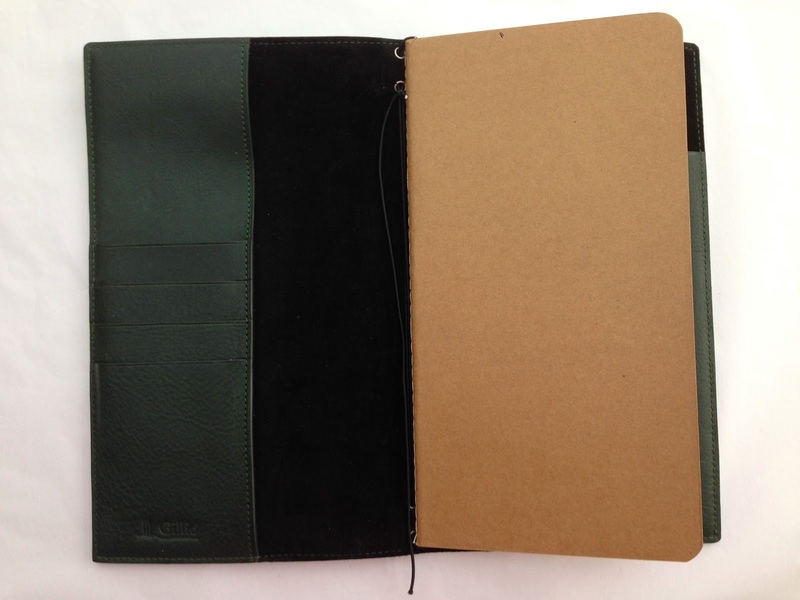 You can buy three to four traditional-style full-size covers – Midori or similar models – for the same price. So clearly this Globetrotter needs to be something special. Long story short, it is. There are several details and enhancements that collectively justify Gillio’s price for the Giramondo. While we’re talking about price, let me disclose here that I didn’t pay it. Gillio gave me this product as a review copy. It’s a full production version, identical to the one you will receive if you decide to buy one of your own. This hasn’t influenced my opinion of the product, as far as I can tell. I have also had the opportunity to discuss the Giramondo with Tom Van Haelen of Gillio by phone to clarify a few design and production points. Similarly, I don’t believe this has compromised my independence. So, what are these details and enhancements? It’s worth spending a moment on the leather. This is what Gillio is known for, of course, and the Giramondo boasts vegetable-tanned Tuscan epoca leather, in a choice of 6 colours (yes, that does include purple.) 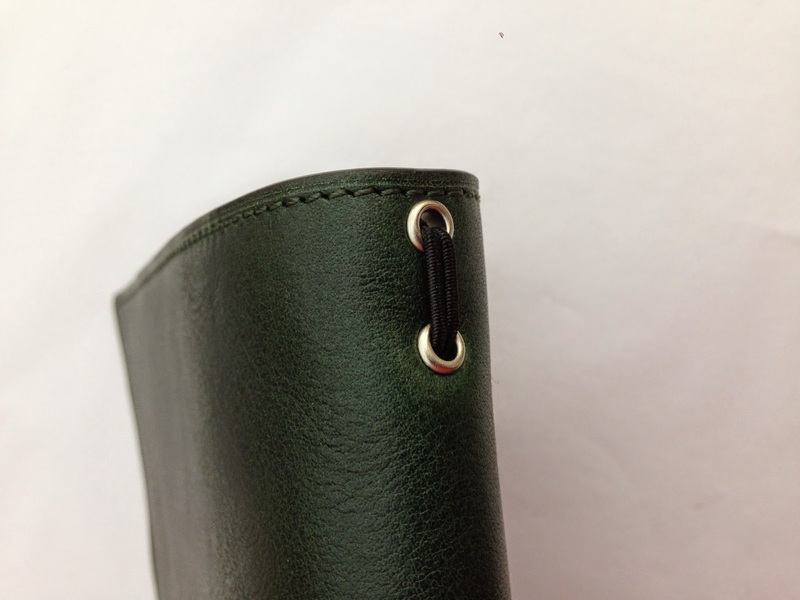 Delicately stitched and edge-finished, this is a robust but supple leather that is going to enjoy a very long life. Tom tells me that the new production contains a further three choices: burgundy, grey and pink. Opening it up, my first surprise was the lack of an insert booklet. I have plenty of those, of course, but a user buying this as their first traveller’s notebook would be disappointed to have to source a booklet separately (one isn’t available from Gillio, even as an additional purchase.) 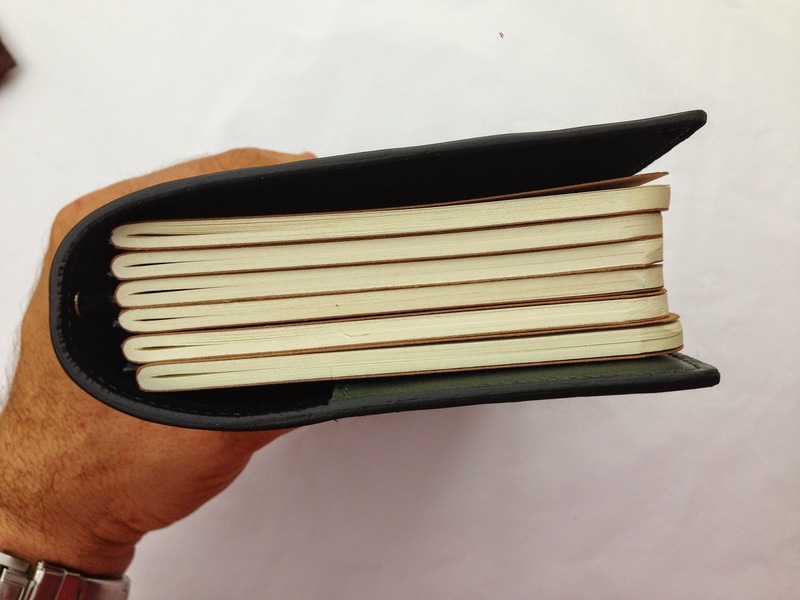 Tom knows this might prove an issue for buyers who are not already traveller’s notebook users, and there are plans to provide a booklet in due course and perhaps even market a range of different insert booklets. I put in one of my own full-size (210mm x 110mm) booklets. Later, I put in more, but that will come later. Notice the long pocket on the left and the four credit card slots. 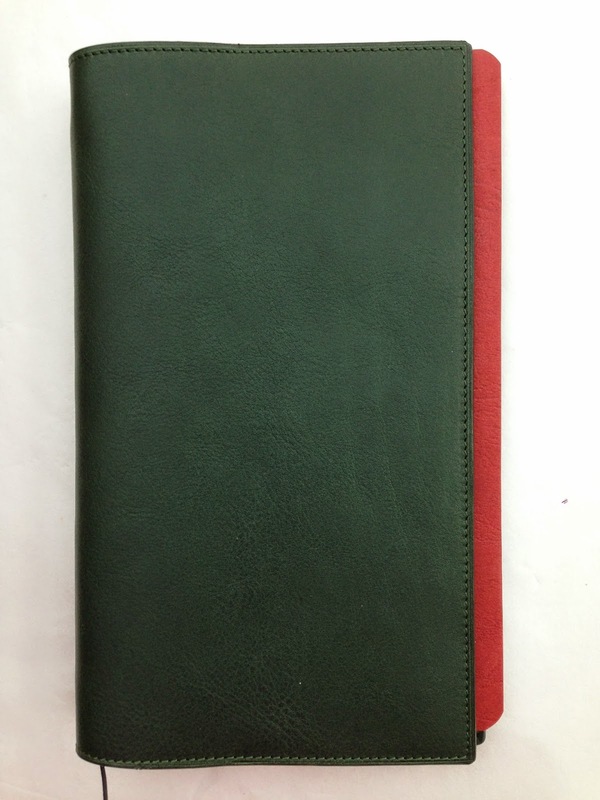 Together with the secretarial pocket on the inside back cover, this lets the Giramondo double-up as a wallet or at least a travel documents organiser. This nicely solves the problems we all know that arise from the lack of inner pockets in traditional covers. Another nice detail is the holes, which benefit from the addition of grommet reinforcements. 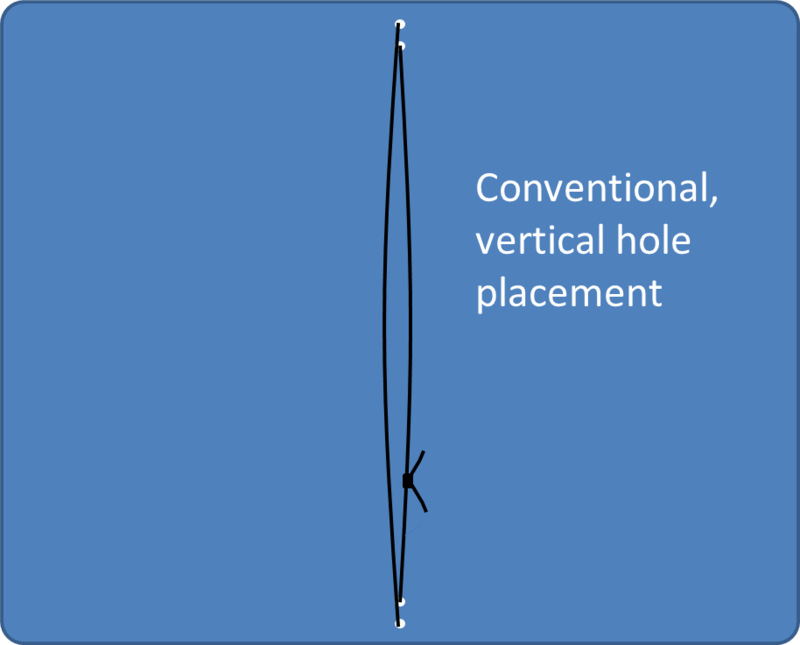 As you can see, the holes are big enough to let you add further elastics and experiment with alternative stringing systems. 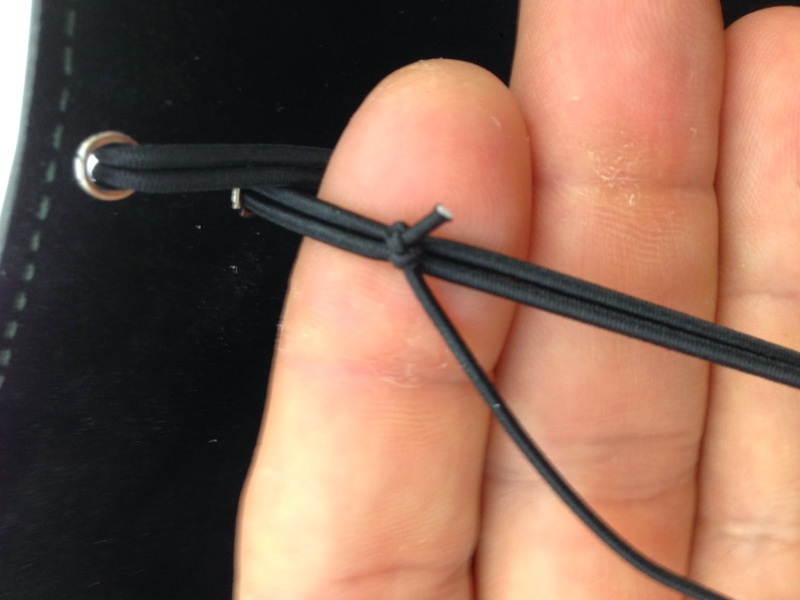 It looks from the photograph that there are two independent elastics in use as standard, but that’s not quite the full story. Here’s the inside view of the default stringing. This placement means the bookmark string to be used has to go upwards to the top of the booklet, go over the top and then come back down on the inside. This might work if the bookmark string were long enough to do that and still protrude from the bottom of the booklet. It isn’t. Restringing is no big deal for most of us, but I feel the first-time user might get a little lost. I raised this with Tom and he’s aware that this wasn’t right in the initial production run. This will be fixed for the new production. Let’s go back to the use of insert booklets. Notice that Gillio has considered the controversy as to whether the securing band should best emerge from the spine or from the centre rear of the cover and addressed the issue with a compromise! At first glance this is a compromise that will satisfy neither camp, but in use this turns out to be a pretty effective arrangement. 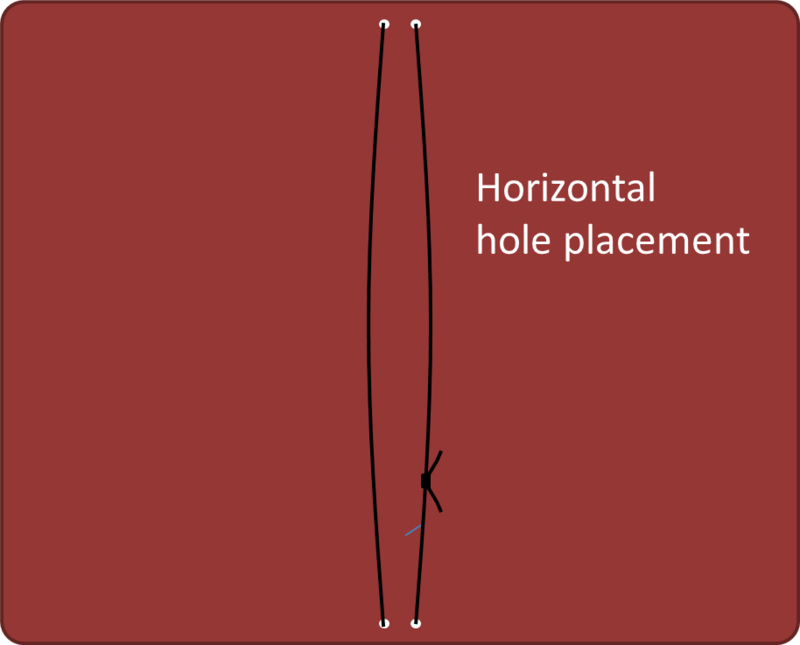 The placement nearer to the spine makes opening and closing the cover feel just the same as a spine-anchored band, whilst leaving the spine unblemished by a central hole. 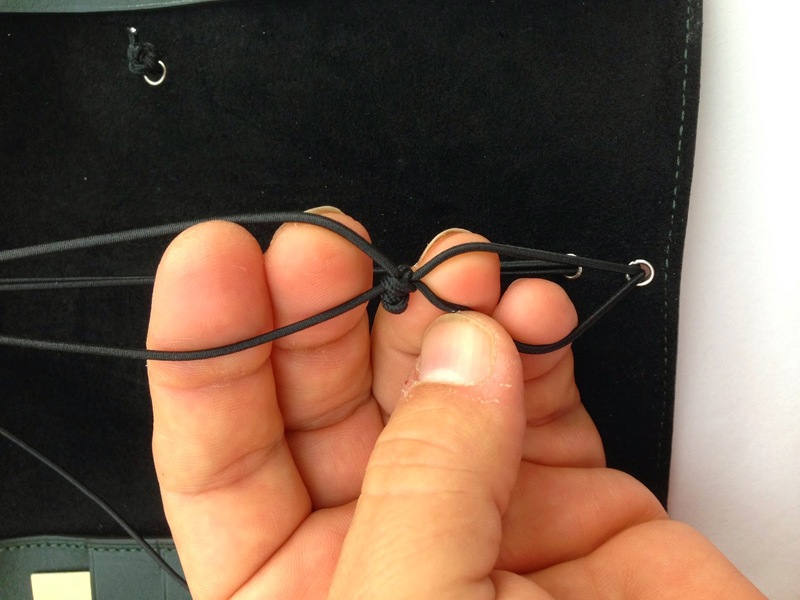 The problem with the Midori configuration, where the band emerges from the middle of the back was always that of writing in a booklet that sits atop a central knot. The Giramondo configuration, though, is much more comfortable. With the knot sitting nearer to the left-hand margin of right-hand pages, its influence doesn’t disturb writing across the whole page but just in a small region and even then only at the very back pages of a booklet. What looked at first like a clumsy compromise is actually a well-considered, innovative and effective feature. During an afternoon with the Giramondo, I became rather besotted with it. It really is an exquisite piece of luxury leatherwork. But it has little to do with the traditional traveller’s notebook that I know and love. When I reflected on this, it made me think of jeeps and backpacks, travel essentials which have themselves been turned into luxury goods. The gap-year canvas backpack is utilitarian. It can be thrown around, soaked, abused and will acquire a comfortable, distressed quality. But the chic, black leather backpack that carries your MacBook Pro and gets admiring glances in Starbucks has an entirely different aesthetic. You can drive a khaki Land Rover with its pre-war styling through the muddy valleys of South Wales or you can drive your climate-controlled Mercedes 4x4 along the smooth streets of Canary Wharf. Both have their attractions. Should you own a Giramondo? Is it worth the money? The answers will depend entirely on your lifestyle and pursuits. For me, though, it’s a ‘yes’ and another ‘yes’. I am giving away this review Giramondo, with Gillio’s permission. 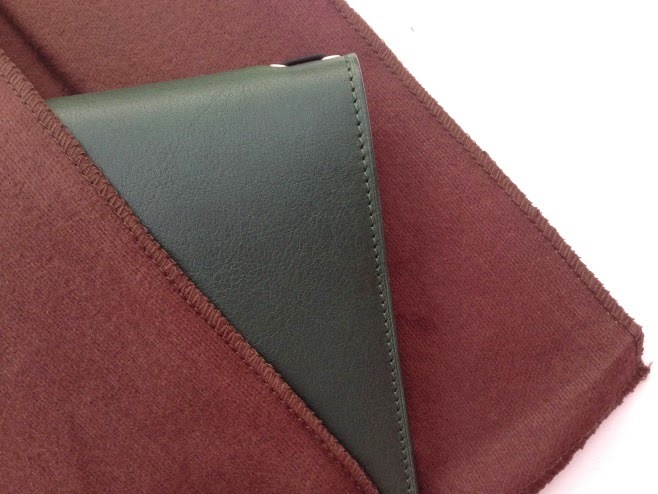 So if you like luxury leather goods and you’re cool with Green, you could be in luck. But time is short. After the draw closes, one commenter will be chosen at random and will be the new owner of this lovely Giramondo. I will throw in a booklet or two as well. The draw is open to all, wherever you are in the world. I will cover the shipping costs. Let’s say you don’t win. Or let’s say you don’t like green very much. 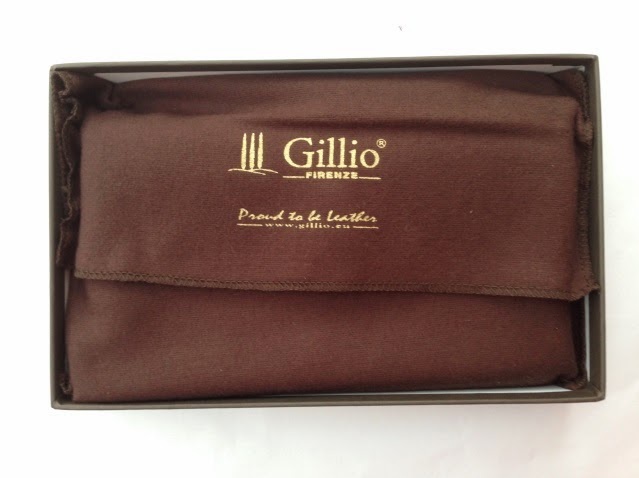 Well then, perhaps you want to buy a Gillio Gramondo of your own. Gillio are giving providing us with a 10% discount on all orders made on their website between now and the end of next Sunday, 26 October. Those orders will ship from the new production, which is due to ship on 12 21 November and includes the three new colours. Following my interview with Sheng Chen of DIY Fish, many of you will have entered the giveaway contest. To see if you are one of the winners, visit the DIY Fish blog and view the announcement. There are a couple of home-made tools in there, too, that might make your own booklet making easier.